However, some Vista and 7 computers have trouble with sound-related applications. Therefore, please use this System Test program to determine whether or not Music Of The Spheres v 1.2 will function on your computer before buying. 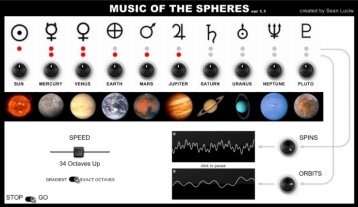 Music Of The Spheres ver 1.2 is a standalone cosmic emulation synthesizer. By speeding up the spinning of the planets and their orbital movements around the Sun, we can hear the actual harmony of the Solar System! You will be taken to the download page after donating. The User's Guide is automatically installed along with the Music Of The Spheres synthesizer; however, you may also download the User's Guide separately.